A middle aged male with HIV who has been off his HAART medications presents with 2 weeks of left knee pain. There was no trauma to the knee and he has no weakness. He denies any fevers, chills, diarrhea, and night sweats for the past 2 weeks. Below are a picture of his knee and the bedside ultrasound. What is on your differential? What will your work up include? Scroll down for the case conclusion. Case Conclusion: An arthrocentesis was performed on the knee with return of the gelatinous clear substance shown. Cultures, including fungal cultures, TB testing, and cell count and differential were negative. Medial collateral ligament bursitis was found on MRI. Knee ultrasound can be used to evaluate for tendon and ligamentous injuries, Baker’s cysts, bursitis, and DVT of the popliteal vein. To evaluate the knee, the patient should be either sitting or supine with their knee flexed to 30-45 degrees. The joint can be dynamically evaluated with range of motion to evaluate for tendon and ligamentous injuries. Bursitis is inflammation of bursa and most commonly occurs in the shoulders, knees and hips. The most common cause is repetitive friction (think Housemaid’s knee with pre-patellar bursitis), although septic bursitis should always be considered. The most easily seen bursa on ultrasound is the suprapatellar bursa, which normally has no more than 2mm of physiological fluid on ultrasound. Not all bursa will be seen on ultrasound if no physiological fluid is present. Bursitis can cause the synovium to proliferate and thicken. Therefore, bursitis should be suspected if the ultrasound shows enlargement of a bursa sac with an irregularly thickened synovium . Bursa may demonstrate septations or echogenic material that can be seen in hemorrhagic and inflammatory bursitis . Ganglion and synovial cysts can are similar in appearance, and can come from a nearby bursa or joint capsule. These cysts have a connective tissue lining filled with mucinous-like material that will also be anechoic on ultrasound . Though not as common as pulmonary or CNS infections, patients with HIV also develop musculoskeletal infections, usually with a CD4 count of less than 250 . 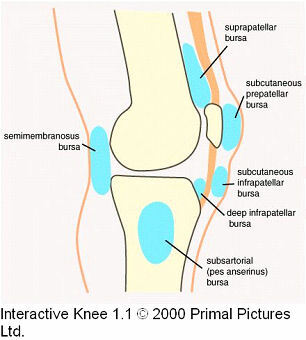 Patients with septic bursitis usually present with olecranon or prepatellar bursitis. Common organisms include S. Aureus and Strep pyogenes, but testing for Mycobacterium and sporothrix should also be considered. Musculoskeletal TB can be found in 1-5% of patients with TB, and usually occurs in the spine. Tuberculous arthritis affects the hips and knees and is the second most common site of musculoskeletal TB. It presents with fever, arthralgia and joint swelling from effusions, synovial hypertrophy, or periarticular abscesses. Other common musculoskeletal infections in HIV patients include cellulitis, pyomyositis, septic arthritis, and osteomyelitis . Case Conclusion by Alicia Oberle. 1. Razek AA, Fouda NS, Elmetwaley N, Elbogdady E. Sonography of the knee joint. Journal of Ultrasound. 2009 June; 12(2): 53-60. 2. Friedman L, Finlay K, Jurriaans E. Ultrasound of the Knee. Skeletal Radiology. 2001 30(7): 361-377. 3. Tehranzadeh J, Ter-Oganesyan R, Steinbac LS. Musculoskeletal disorders associated with HIV infection and AIDS. Part I: Infectious musculoskeletal conditions.